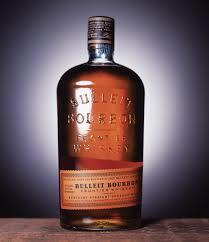 Bulleit Bourbon, another 45% bargain. I don’t ever recall seeing this on Supermarket shelves until this year, perhaps it’s because I’ve not been looking for bourbon before, well not past my usual tipples, but recently I’ve seen Bulleit on sale and, even better, on offer, in all the major stores and I picked this up just after Christmas for the low low price of twenty pounds. Nose. Light and full of vanilla, charred barrel comes through, caramel and oak, yeah it’s a bourbon, there’s no doubting that. Palate. A little heat, smokey from those charred bourbon barrels and the familiar caramel, orange honey and vanilla. Woody and spicy, it’s very decent for the money. Finish. Reasonably long actually, smokey, warm, caramel and a little bit of baked apple strudel spice, it’s very appealing. A while back another blogger and all round good chap once lit a roaring fire, settled in his wing tipped antique armchair lit up a cigar and claimed online that “all bourbon tastes the same” before settling back and picking up the popcorn, now there is an important point in this namely that a lot of bourbon does have the whole charred barrels, vanilla and caramel going on and it’s fair to say that many bourbons do share several key flavours and this whiskey is certainly part of that group, it is however a decent drink, it’s 45% and it won’t be full of dodgy colour or flavouring because it wouldn’t be bourbon if it did. But that’s not to say it’s poor quality because that’s just not the case, this has a lot going for it and I’ll argue til my last breath that it’s more of a bargain that pretty much any Scotch at this low low price, so get involved before they stick another tenner on it. Previous Like being wellied the goolies? Then this is for you.